John the Baptist preached the baptism of repentance for the remission of sins. Jesus was baptized by John, and the voice of God declared, “Thou art my beloved Son” (Mark 1:11). Jesus began to teach and work miracles by divine power and authority. Jesus Christ forgave and healed a paralytic, dined with sinners and called them to repentance, and taught about the Sabbath. After Jesus healed a man on the Sabbath day, some people began to plot how to destroy Him. Jesus ordained Twelve Apostles, refuted accusations that His power came from Satan, and taught that those who do the will of Heavenly Father are His family. Jesus taught in parables, including the parable of the seed growing by itself. Jesus calmed a storm and His disciples asked, “What manner of man is this?” (Mark 4:41). In testimony meetings, what is valuable about hearing testimonies from several individuals rather than just one person? What do you think might be valuable about studying the Gospel of Mark, now that you have studied the Gospel of Matthew? Ask students to read “Why study Mark?” and “What are some distinctive features of Mark?” under “Introduction to the Gospel According to St. Mark” in chapter 11 of the student manual. Ask them to look for why studying the Gospel of Mark can be valuable and relevant to them. After students have read, ask them to share why they think studying the Gospel of Mark will be valuable and relevant to them. To help your students understand more about Mark’s purposes in writing, read “To whom was Mark written and why?” also in chapter 11 of the student manual. Part of effectively teaching the context and content of scriptures is helping students understand the intent of the inspired author. Nephi was able to “liken” Isaiah’s writings to his people because he understood Isaiah’s original context and meaning (see 1 Nephi 19:23–24; 2 Nephi 25:1–6). When we help students understand the writers’ purposes and the circumstances in which they wrote, students can better identify, understand, and apply scriptural truths in their lives. If you had lived at the time Mark wrote, how do you think his Gospel might have helped you? Explain that the Joseph Smith Translation changed the title of this Gospel to “The Testimony of St. Mark.” Mark’s most important purpose in writing was to bear testimony that Jesus was the Messiah and that the gospel being taught was His gospel. Explain that as we better understand Mark’s purposes in writing and the circumstances in which he lived, we can better understand how his Gospel blesses us in our day. To help students understand more about how Mark’s Gospel can bless them as it may have blessed the Saints in Mark’s day, display a picture of the Savior calming the storm. You could use the picture in the student manual commentary for Mark 4:35–41 or Jesus Calms the Storm ( Gospel Art Book , no. 40; see also LDS.org). 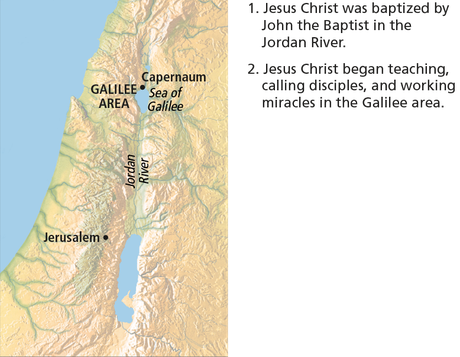 Ask students to summarize what they know about the story of the Savior calming a storm on the Sea of Galilee. Have students read Mark 4:36–41, looking for details they might not have remembered. You might also want to have students read parts of the student manual commentary for Mark 4:35–41. What do verses 37–38 suggest about how the disciples were feeling about their situation? According to these verses, how did they feel about the Savior? What difficult or “stormy” circumstances were followers of Jesus Christ facing in Mark’s time? What kinds of “storms” do we face in our own day? How might this miracle have given hope to members of the Church in Mark’s day? When have you seen evidence of the Savior’s power to calm the storms in our lives? 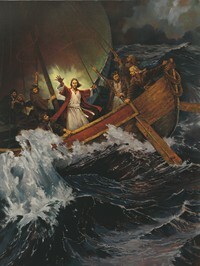 “In turbulent and sometimes frightening times, the Savior’s promise of infinite and eternal peace resonates with special power to us, just as His ability to calm the crashing waves must have profoundly affected those who were with Him on the Sea of Galilee that stormy night so long ago” (“The Peaceable Things of the Kingdom,” Ensign, May 2002, 87). Summarize this part of the lesson by explaining this principle: Studying the Gospel of Mark can strengthen our faith in Jesus Christ and our courage to follow Him. Invite students to be prayerful as they study and to be attentive to truths they can learn from Mark’s Gospel that add to what they learned by studying the Gospel of Matthew. Ask students to look at Mark 1:22, 27; 2:10; 3:15, and mark in each verse the word authority or power. What can you learn about the Savior by paying attention to the words authority and power in these verses? Explain that one of the major themes in the Gospel of Mark is: As the Son of God, Jesus Christ came with power and authority. The first chapters of Mark help us recognize that the authority of Jesus Christ was evident from the beginning of His ministry. Jesus Christ demonstrated His authority when He . Jesus Christ has power to . Jesus Christ is more powerful than . Jesus Christ has power over . Jesus Christ demonstrated His authority when He taught His doctrine. Jesus Christ demonstrated His authority when He commanded an evil spirit to come out of a man. Jesus Christ demonstrated His authority when He healed Simon’s mother-in-law. Jesus Christ has power to forgive sins and to heal the sick. Jesus Christ is more powerful than Satan. Jesus Christ has power over the wind and the sea (the forces of nature). How would you summarize the information in the chart? Think about some of the Savior’s teachings and miracles. Which ones have brought you a greater understanding of His divine power and authority? How would you define the meaning of the word repentance, using only one sentence? “Repentance is one of the first principles of the gospel (see Articles of Faith 1:4). It is essential to your happiness in this life and throughout eternity. Repentance is much more than just acknowledging wrongdoings. It is a change of mind and heart that gives you a fresh view about God, about yourself, and about the world. It includes turning away from sin and turning to God for forgiveness” ( True to the Faith: A Gospel Reference , 132; italics added). Why would repentance be incomplete if someone tried to turn away from sin without turning to God? Why would repentance be incomplete if someone tried to turn to God without turning away from sin? Help students understand the content of these verses by asking them to explain what the phrases on the board mean. You could ask questions like the following: What is implied by the word beseeching, compared to the word asking? (Beseeching means “begging” or “imploring,” while the word asking can mean “requesting help.”) What is suggested by the fact that the man was “kneeling down” to Jesus? (The man was humble and felt reverence for the Savior; perhaps he also felt desperation.) Write your students’ explanations next to the phrases on the board. Ask students to silently read Mark 1:41–42 and the first paragraph of the student manual commentary for Mark 1:40–45. As they read, ask them to imagine how they would feel if they were the leper. Based on what you have learned about leprosy, how do you imagine the man’s life changed after this experience? How can each of the phrases on the board apply to repenting and seeking forgiveness from God? What do these verses teach about how the Savior regards those who turn to Him to be cleansed? Bear testimony of this principle: When we turn to the Savior to be made clean, He has compassion on us and makes us clean. When discussing the comparison between the healing of the leper and obtaining forgiveness, you might need to clarify that while the leper was healed “immediately” (Mark 1:42), repenting and obtaining forgiveness of sins usually requires more time. However, turning to the Lord in faith does begin to make an immediate difference (see Alma 34:31). If time permits, you might have students read the poem by President Boyd K. Packer in the student manual commentary for Mark 1:40–45. This poem likens the Savior’s healing of lepers to the forgiveness that we can receive through repentance and the Atonement of Jesus Christ. What impresses you about what this group of five people did to reach the Savior? Ask students to read Mark 2:5–12, looking for the two miracles the Savior performed for the man. Rather than having students read Mark 2:5–12, consider showing the video “Jesus Forgives Sins and Heals a Man Stricken with Palsy” (2:57) from The Life of Jesus Christ Bible Videos, available at LDS.org. This video covers Mark 2:1–12. Ask students to watch for the two miracles that the Savior performed for the man. Write this principle on the board: If we exercise our faith and come unto the Savior, we can be forgiven of our sins. Explain that the next account in Mark teaches more about repentance and forgiveness. Explain that in cultures throughout the world, there are important meanings connected to social customs such as dining together, shaking hands, bowing to a person, or greeting someone with an embrace. To illustrate this, ask students to explain the meaning of an action that is a custom of friendship in their culture. Ask students to learn what the custom of dining together meant in New Testament times by reading the student manual commentary for Mark 2:15–17. Why would the dinner with Jesus have been especially meaningful to Levi and the “publicans and sinners” who had decided to follow Him? How does this custom help explain why the scribes and Pharisees acted the way they did, as recorded in Mark 2:16? Ask a student to read the Savior’s response to the scribes and Pharisees, as recorded in Mark 2:17. How did the Savior describe people who need repentance? (They are like “sick” people who need a “physician.”) How is repentance like going to a physician? Explain that the account of the Savior’s meal with Levi and the scribes and Pharisees can help us understand this principle: When we repent and receive forgiveness from the Savior, we enter into His fellowship. Ask students to share their responses to this question: Think about the account of the leper, the healing of the paralytic, and the Savior’s eating with sinners. How do these accounts help you understand that repentance leads to forgiveness of sins and fellowship with Jesus Christ? Note to teacher: Because of the personal nature of the questions the students are asked to ponder, it is not appropriate to ask for verbal answers. As students silently ponder, they invite the Holy Ghost to teach them individually. President Dallin H. Oaks of the First Presidency taught that we “need quiet time and prayerful pondering as we seek to develop information into knowledge and mature knowledge into wisdom” (“Focus and Priorities,” Ensign, May 2001, 83). Elder Richard G. Scott (1928–2015) of the Quorum of the Twelve Apostles declared that “a powerful testimony distills from quiet moments of prayer and pondering” (“The Power of a Strong Testimony,” Ensign, Nov. 2001, 88). Who were the “unclean spirits” and “devils”? How did the evil spirits know that Jesus was the Son of God? What is the meaning of the Savior’s analogy of “the strong man”? After having students report their answers, make sure that they understand this truth: Jesus Christ has power over unclean spirits and devils. Then ask: What does this truth mean for you in your struggles against Satan? Bear testimony that the Savior is more powerful than Satan. With the Savior’s power in our lives, we can overcome the adversary’s efforts to harm us. Study together Mark 2:1–12 and the student manual commentary for Mark 2:2–5. Help the students understand this principle: Great miracles can result when we unite our faith with others. Ask students when they have seen evidence of President Henry B. Eyring’s testimony that “adding together the prayers and faith of many draws down the influence of the Spirit.” Or you might ask: When have the efforts of faithful friends brought you nearer to the Savior? What are you doing in your life to be the kind of friend who brings others closer to Jesus Christ? Ask students to think about a Sabbath day that they feel they truly kept holy and then ask: How did keeping that day holy make a difference in your life? What were the good things you did that day? Invite students to think about the Savior’s statement about the Sabbath and about the teachings of latter-day prophets concerning the Sabbath (see “Sabbath Day Observance,” For the Strength of Youth [booklet, 2011], 30–31). Then ask them to examine their own Sabbath observance and identify ways they could better keep the Sabbath holy. Bear testimony of this principle: We glorify God when we rest, worship, and do good on the Sabbath day. When in your life have you had to trust the Lord to do what only He can do, after you have done your part? When has the Lord caused spiritual “seeds” to grow in you or someone you know?